Niger, one of the world's poorest countries, is at the heart of a complex region. Domestically, the country has seen long periods of political stalemate and military rule since its independence. 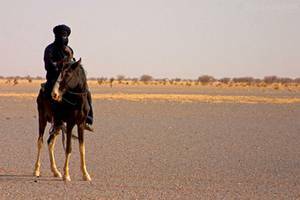 The country has also faced periods of armed rebellion from some Tuareg communities - in the 1990s and most recently in 2007. Niger is also significantly placed within the Sahel-Sahara zone, and has therefore felt the impact of turbulence in neighboring states, including armed Islamist and Tuareg separatist movements in Mali, religious and political violence in Nigeria, and state collapse in Libya. Niger has taken on an increasingly important role in anti-terrorist operations in the region, including joining a regional coalition to combat Boko Haram in 2015. Niger has also become the home to hundreds of thousands of refugees fleeing the violence of both the Boko Haram insurgency in the Lake Chad Basin, and the continuing conflict in northern Mali. In the Diffa region, the UN recorded the presence of 241,000 displaced people in 2016k, including 105,000 Nigerian refugees, and 121,000 IDPs. Their insecurity is worsened by Boko Haram attacks spilling over the Nigerian border from 2015 onwards. In June 2016, an attack in Bosso displaced a further 70,000 people, prompting the deployment of Chadian armed forces. A year later in 2017, two suicide bombers attacked a refugee camp – also in the Diffa region - killing nine and abducting 40 people.